Each year, thousands of birds, turtles and other animals die after becoming entangled in fishing line or stuck with fishing hooks. On WILD’s very first outreach day in the park, a visitor alerted us to this female mallard in distress, entangled in a six-pronged barbed hook. She was first hooked in the webbing of her foot and by trying to free herself with her bill, her tongue then became ensnared. The members of WILD along with an urban park ranger were able to free her. The ranger determined that her health was not compromised and she was then released. 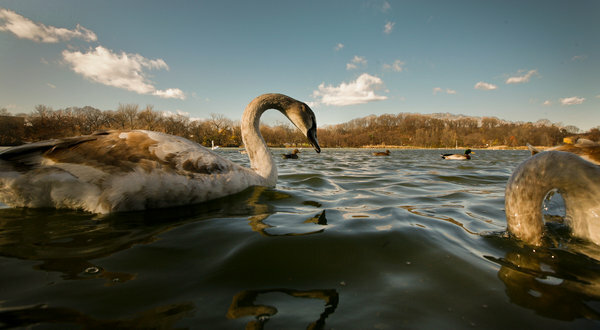 December 14, 2011- By Lisa W. Foderaro "Juvenile" Mute Swans in Prospect Park, Brooklyn where animal activists have rescued waterfowl from dangers such as discarded fishing line and hooks. 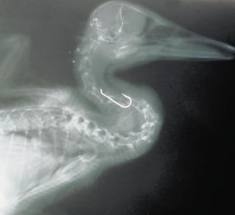 AN X-RAY of a duck with a fishing hook in its throat - the only way to remove it is for a vet to cut the bird's neck open. Ingested fishing line can cause intestinal blockage. It will fill up the animal’s stomach preventing it from feeling hunger, causing starvation. Chemicals in the monofilament may poison the animal. Entangled wildlife cannot fly, run, swim, forage for food or protect itself from predators. Once an animal gets ensnared in fishing line, it can tighten to the point where it cuts through the skin and into the bone. Infections incur, circulation is cut off resulting in amputation. The animal can suffer an agonizing death. Birds often use the line to build nests as seen in the photo above. Once entangled within the nest, they can’t get out proving deadly for parents and offspring. Discarded fishing line became wrapped around the leg of the goose in this news piece, cutting in so deeply, it is at risk of losing it's right leg. By taking precautions and acting responsibly you can help to make the park a safer place for wildlife and park visitors. • Fishing is "catch and release" only. Once a fish is caught, remove the hook and return it to the Lake unharmed. • No barbed hooks are allowed. • Anglers must respect the habitats and nesting grounds of birds and waterfowl. • Leave fishing sites clear of all debris. • Careless disposal of fishing line poses extreme hazards to birds and small animals. Hooks are especially dangerous to children and wildlife. • Please take home even the shortest length of line and dispose of properly. OR dispose of line in one of the 4 fishing line recycling bins provided by FIDO located along the Lullwater and near the Well House by the lake. 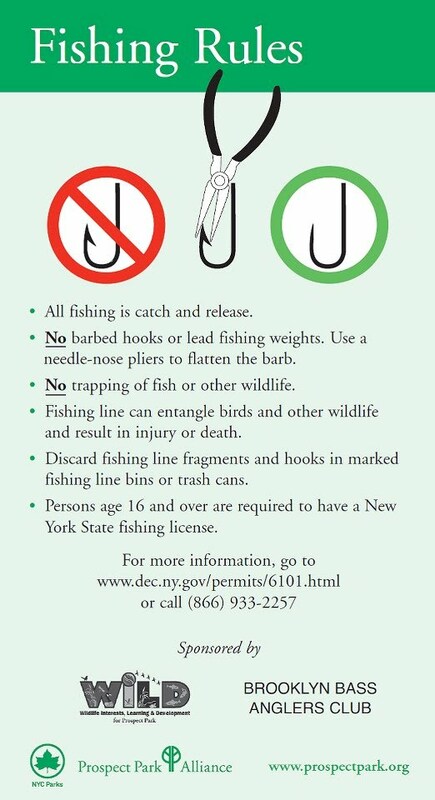 • A New York State fishing license is required to fish in Prospect Park for people 16 and older. Any fishing abuses witnessed should be immediately reported to the DEC. The number to call is 1-800-TIPPDEC 1 (800) 847-7332. Abuses to report: Use of barbed hooks. Keeping fish or throwing dead fish back in water. Ignorance in removing fish from lines. Fishing in off limits areas. Catching turtles or other wildlife. Improper disposal of fishing lines.